Property 2: The apple trees in bloom, a show not to be missed: offers last days !!! Great farmhouse in wonderful area! Our hosts Erwin and Christina were very cordial. The two bedroom apartment was very nicely built and furnished. The Kitchen was nicely equipped and the balcony overlooking the village was a special place to enjoy. The Bathroom was large and tastefully designed also. The Master bed room was large with a king bed. The second bedroom had two single beds and was perfect for my children. 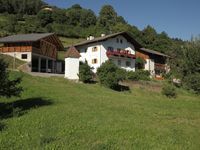 The village is at the footsteps of the Unesco Dolomite area, and also close to Bolzano which is full of shops and restaurants, the village has a bakery, small markets, and a few restaurants. The setting up on a hillside and away from town provided more exclusivity and peacefulness than the more touristy village locations would offer. The hosts operate a small poultry operation and they surprised us with some free quail eggs on our arrival. We were able to get a sense of the lifestyle of Germanic people living in agrarian communities in the Southern Tyrolean Alps. The apartment is on the second floor of a house nestled along the mountainside with a wonderful view of the valley below and the neighboring hills. The place is very clean and very comfortable. Because the weather was so pleasant in late May, we were able to enjoy our meals on the balcony that shows in the picture of the house used in the HomeAway ad. The owner was very attentive to our needs. It was nice to have a garage for our car. The scenery in the area is amazing, and this home is a good base for seeing it.